Sometimes we go to the supermarket on Saturday evening right before they close and try to save some food which would otherwise be tossed on Monday. 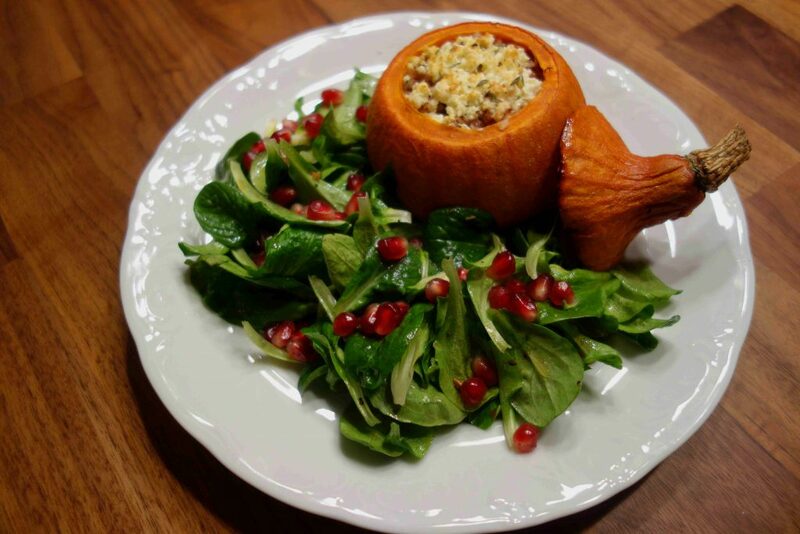 The last time we saved some Feta cheese, so we took it home and made this wonderful stuffed pumpkin. The red kuri squashes were from our garden and they were pretty small. So I made one squash for each of us. Nevertheless, I’m sure that this will also work with one bigger red kuri 😉 For the stuffing I chose buckwheat, walnuts, feta and some spices. If you want to make it vegan, try using vegan Feta made from tofu. First, preheat the oven to 180°C (360°F) and precook the buckwheat. Therefor pour the buckwheat and 300ml of cold water in a pot, bring it to a boil and add some salt. Then you reduce the heat to small, put a lid on top and let the buckwheat soak for 15 minutes. Meanwhile prepare the squashes. In order to do this, cut the top of them and remove the seeds using a spoon. Then you thoroughly wash the squashes. Now crumble the Feta in a small bowl and dress it with some pepper, thyme and olive oil. Subsequently, you just have to roughly chop the walnuts. When the buckwheat is done, mix it with the chopped walnuts and the majority of the feta. Now season the stuffing to taste with some salt and pepper and add it to your squashes. Then you spread the rest of the dressed feta on top of the stuffing. Put the tops back on the squashes and put them in the oven for 40 minutes in total. Remove the tops after 20 minutes to allow the Feta cheese to brown a little. Those are perfect, especially when served along with a lamb’s lettuce with a light vinaigrette and some pomegranate seeds.